Moda Black release a limited edition vinyl featuring a brand new, unreleased Dubfire remix of Hot Since 82 and Habischman’s ‘Leave Me’. Moda Black is in the midst of one of its most prolific years to date, having just released the second edition of Little Black Book, this time curated by Groove Armada, as well as propelling a raft of new talent via EPs from Theo Kottis, Walker & Royce, Sidney Charles and label owners Jaymo & Andy George. 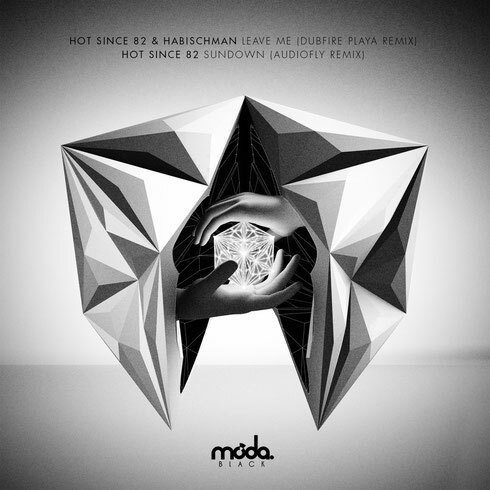 The label also hosted their inaugural Lost Village in May and continuing this momentum, they have just released a brand new Dubfire rework of Hot Since 82 and Habischman’s Leave Me. When Dubfire asked for the remix parts for ‘Leave Me’, following Lee Burridge’s Burning Man set, there was a feeling that something special was afoot - a remix motivated purely by a passion for the original. A few months later a brooding, stripped down techno rework was delivered, and has since been causing all manner of commotion for Dubfire and HS82 respectively. Now available for the first time publicly, this special remix is now available on a limited edition coloured vinyl. On the flipside, Flying Circus founders Audiofly dismantle Hot Since 82’s ‘Sundown’, reworking it into a ten-minute spaced out but provocative journey that utilises many of the duo’s signature moves. Hot Since 82’s ‘Leave Me / Sundown (Remixes)’ is out on limited edition coloured 12” on 21 August.